The Tuffy Bowmerang is a tough floating fetch toy. Here's a versatile floating fetch toy with LASTING power! Throw it like a frisbee. Toss it in the water. Give it a go for flyball training. Use it as a tug toy. The Ultimate Bowmerang is 25 cm of toughness and perfect for all types of interactive dog play. Veterinarian Recommended and Approved! What's great about the Bowmerang? This toy has 7 seams of strength. However, if your dog is a super crazy chewer this toy is not recommended. If you have a dog whose reputation is to seek and destroy stick with our Toys for tough chewers. 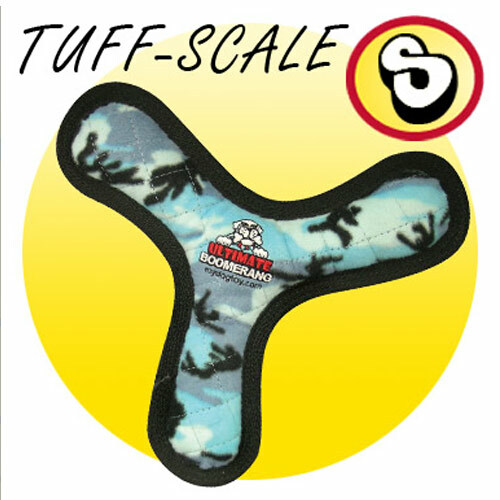 Tuffy Toys are still some of the toughest soft toys on the market. Each Bowmerang starts with 2 layers of industrial grade luggage material, 1 layer of plastic coating, and 1 layer of soft fleece on the outside. The four layers are sewn together to make a single super strong layer of material. Then the toy is reinforced with 2 layers of cross stitching plus 2 layers of linear stitching. Then an additional piece of black trim is added to cover the 4 rows of stitching. Top it off with an extra piece of nylon on top sewn on with 3 linear stitches to give the product a total of 7 seams! Read 7 customer reviews of Tuffy Toys Bowmerang. The average customer rating is 4.1. Excellent, very strong toy, our lab Fred can’t get through that one! Floats too! 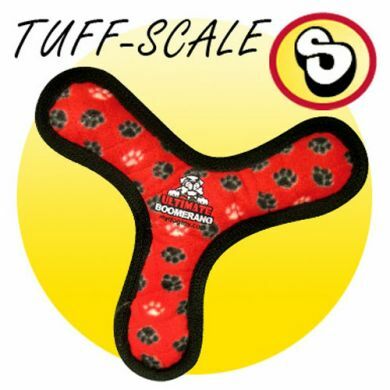 Great toy, unlike his other tuff toys there is not a loud squeaker in this one. 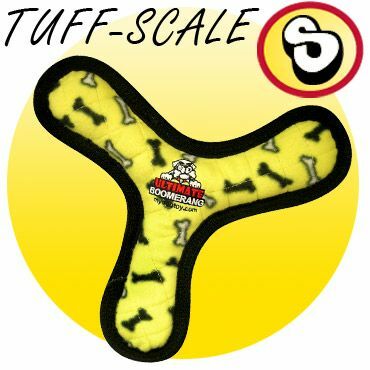 It is a very durable toy and great for tug games. My dog is named Milo and she is a Chocolate Labrador. She loves playing with the Bowmerang in and out of the water. If you have a dog that loves to chew and hates squeakers then this is definitely NOT for you. I was disappointed to find that it contained squeakers when the description at the time did not mention them. Needless to say my dog destroyed it in 4 days. I am happy to say that Waggle were fantastic and offered me a great credit which I used to buy another toy without squeakers. Our Koolie cross pup really enjoys this one, and loves both indoor and outdoor play with it. The bowmerang has had several trips through the washing machine and come up looking and squeaking as good as new. Very pleased with this one so far! I have three dogs who usually "kill" new toys very quickly! Norah just loves this one, and so far, no signs of wear! I use this as a tug toy for a dog that destroys "indestructable" toys...lasting well so far!